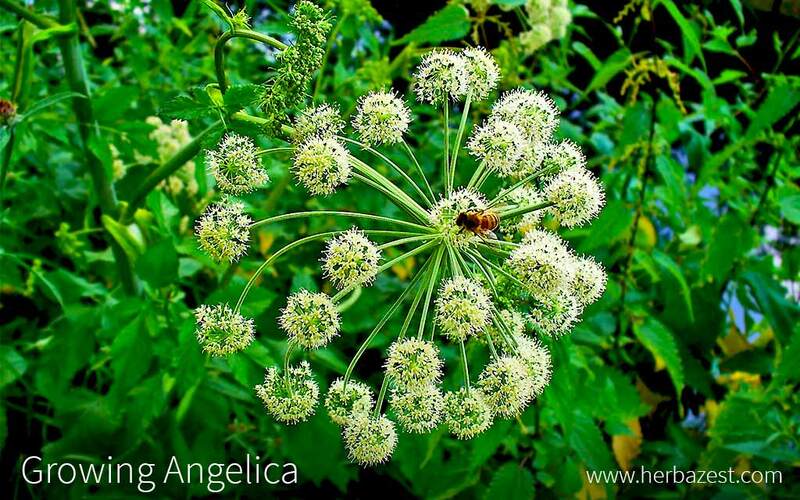 Angelica archangelica - also known as archangel, European angelica, true angelica, garden angelica, and wild parsnip - originated in Eurasia and the first accounts of its domestication come from the Faroe Islands, Iceland, and Greenland. Angelica can be grown in temperate areas and it is a very hardy, adaptable plant. However, in order to succeed in its cultivation, some basic guidelines need to be followed. Angelica is considered a biennial that can last three to four years, especially if flowers are removed. Successful cultivation of angelica requires specific care and patience but the gardener will be rewarded with a beautiful ornamental and useful medicinal plant. For optimum growth, angelica plants prefer partial shade with deep, well-drained, loam and fertile soil. They thrive in moist conditions with a pH of 4.5 - 7.4. The area should be cleared of weeds and the soil must be loosened before planting seeds or divisions. Angelica grows best in the shadiest, coolest parts of the garden, especially during hot summers. Due to its height, angelica is often planted as an accent at the rear of the garden or in shady borders. Staking may be needed in exposed sites. Angelica grows better within a range of temperature of 41 - 66°F (5 - 19°C). Seedlings should be moved outdoors in the spring. If planting from seeds, they should be directly sown in well-composted garden soil about 47 inches (120 cm) apart. Propagation by seed in a cold frame with sufficient light is also possible. It is recommended to sow seeds every year to ensure flowering plants as they are short lived. Watering the soil regularly is as important as keeping the seeds or seedlings well-shaded. This should be done until the plants are established. Germination will take between two to four weeks when sown outdoors. Angelica can also be propagated by division or separation. Divisions of second-year roots or offshoots of second-year plants can be planted in the fall or spring 18 inches (46 cm) apart in three feet (91 cm) rows. To encourage root development, the plants are often transplanted a second time at the end of the first year's growth. It must be kept in mind that once the plant has flowered, it will begin to die, so the roots can be dug up then. If the seeds look mature, they can be planted at once in time for the next season. Any bloom in the fourth year will not be significant since the angelica plants will be at the end of their life cycle. The plants can be treated as biennials to encourage reseeding each year. Fresh seeds should be sown in a greenhouse to be transplanted outside in the spring. Once angelica is established, its seeds will self-sow sparingly. Seedlings should be transplanted when they reach four to six inches (10 - 15 cm) tall as they will form a long tap root. It is better to move seedlings when young as older plants resent disturbance. Angelica's water needs can be described as average. They thrive naturally in cool environments with an annual precipitation of 500 - 1,300 mm. Extended periods of drought will adversely affect angelica's growth. It is important to keep the soil moist, but not soggy, at all times for optimum growth. Irrigation should be provided before the plant wilts or shows signs of water shortage. As other hardy perennials, angelica will benefit from a two to three-inch (5 - 8 cm) layer of organic mulch during the growing season, in order to keep moisture and provide adequate winter protection. Fertilize angelica once a month with 10-10-10 fertilizer. One may also cover the base of the plant with compost to serve as mulch and slow-release fertilizer. Angelica can grow as a perennial for up to four years without replanting if the flower stems are cut back after the plant flowers. If growing angelica for its root, the tops should be pruned regularly to prevent bloom and allow root growth to continue. Growing areas should be cleared of weeds to maintain the quality of the soil and enhance angelica growth. Weed management can be done by hand, hoeing, or spraying herbicides as necessary. Pests and diseases can drastically reduce the yield of harvested parts and esthetic appeal of angelica herb. Learning how to protect the plants is an essential part of growing them. Slugs and snails are of moderate importance as pests to Angelica archangelica when the plant is young. These insects are threats to the herb's leaves. Silvery mucous trails confirm their presence. If necessary, control these pests with blasts of water or an insecticidal soap. Other common angelica pests include red spider mites, aphids, and leaf miners. Viral and fungal diseases such as powdery mildew and leaf spot may attack leaves in late summer. Fungicides may be used to eradicate them. Roots, stems, and seeds are harvested and used as needed, with some parts being ready three to four months after planting. To harvest the angelica plant, the stems should be cut before midsummer, while the leaves can be picked before flowering occurs in July and August, and the ripe seeds can be collected in late summer. Roots intended for flavoring agents are often harvested in fall of the first year from the end of September until the middle of October. Leaves and stalks are generally harvested in the spring of the second year. Seeds are harvested when ripe. The roots of the first year or second year are dug, washed, dried, and stored in tight containers to preserve the aroma. Keep well-dried seeds in boxes or sealed jars in cool, dry places. Leaves and petioles should be consumed the same day but can be frozen for later use. University of Florida, Angelica—Angelica archangelica L.